Dimension brand has worked well for me. It is the QBP house brand and can be ordered up by just about any lbs. Retail is around $70-80. No tools to swap. No clunking or weird noises with either adapters installed. Been riding one for about a year on both types of DO. Hope also has a couple of hubs that are convertible, but a bit more $$. If you want an entire wheelset check out the Azonic Outlaws. I've been using the Dimension also with excellent results--nice front hub. The Outlaw front hub looks good too as we just installed a set on a customer's bike at the shop. You got to buy the conversion axle and it is a 9mm hard axle rather than QR. Last edited by Deweydude; 05-17-2005 at 09:13 PM. I have a hope bulb front hub. JensonUSA has the hub and the conversion kit. I love it and it works great. No tools required. I'll second that. I ran my bulb with QR with my old fork and now run 20mm and it has been great. Rears are also swappable. Do I have to just live with this? Broke my Hugi 240 disc hub! Help pls! 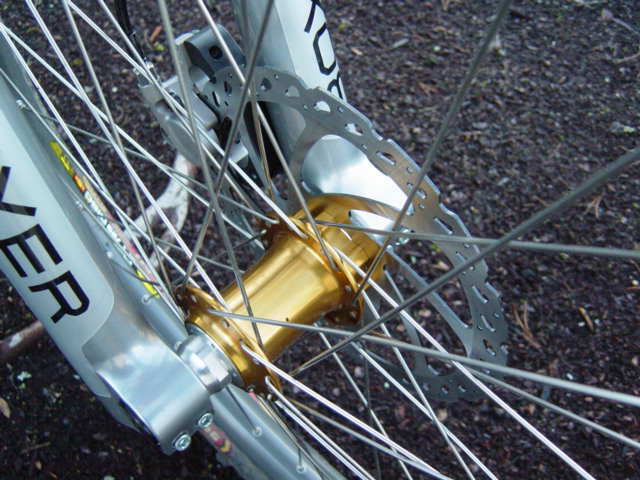 24h rim with 32h hub? Leave every 4th hole out?